Co-teacher have access to all course tools such as the class sites, curriculum tools, student trackers, seating charts, course lockers, calendars, and, of course, the gradebook. Additionally, Co-teachers are included as part of the Learning Management Team for all shared students and parents. This article gives an overview as to how the staffs as co-teachers can access the course management area in their portals. 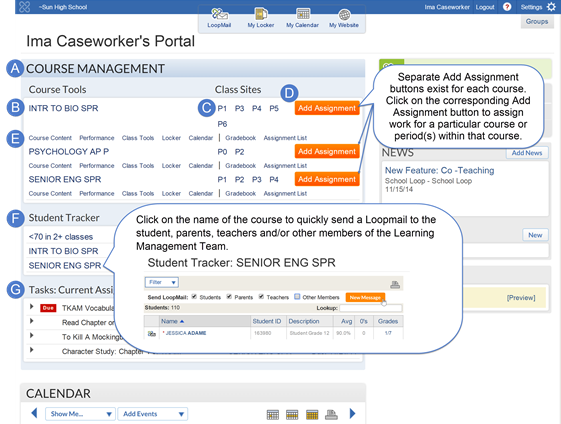 Staff members who are co-teachers gain a Course Management area in their portals where they can find links for all the course tools, and gradebook. See below for more details about staff accounts. Here's a more in depth look at the portal of a staff users named as the co-teacher for 3 courses. Course Management - This area of the portal displays all your courses for the current school year. When courses are not active (i.e. no students are currently enrolled), they are not visible on the portal. Course Name - Click on a course name to go the Course Tools for that subject. Course Tools - The hub for the subjects you teach and are divided into five sections: Curriculum, Student Performance, Class Tools and Bulletin Board, Locker, & Calendar. Current Assignments - Displays current assignments for the week for all of your courses. You can also easily edit, copy, or delete assignments here.